It’s the last official basic shape forms post. Again, I chose to use circles radiating outward. One originates in the upper left corner and the other in the lower right corner of the document. As I started working on the color scheme I chose to keep the variety of colors minimal, as apposed to yesterday’s wavy gravy. Being close to our nation’s capital, it is hard to ignore the politics with all it’s battles and scandals. As I began to include color in this design I imagined the two political parties influencing the canvas of our nation. In the upper left corner we have the Democrat party. Since the Democrat party is the one in power it is given the upper corner. It is also no accident that it is also given the left, upper corner. The Republicans, currently the party out of power, get the lower corner and, of course, it is the corner on the right side of the document. The radiating circle represent the on going influences of these political powers over time. Hopefully we see them balancing out over time to make our country a better, stronger nation. I will stop there and save you my opinion as I’m sure you all have enough of your own. God bless the United States of America and I will see you all tomorrow. Today is the second to last post for basic shape forms. Not sure why I got off of my illustration kick, but there will be more of those in future posts I’m sure. Today’s design demonstrates visually what I shared with you previous when I wrote my thoughts on each of the basic shape forms. Here I see the circle and the triangle as the dominant shapes. The circle visually represents motion as the many rings radiate outward. They also exhibit a certain pattern as they radiate. Each band spreads further from it’s predecessor and the color pattern changes more or less consistently with the natural color spectrum. The circles represent a beautiful routine, on going, throughout the composition. The triangles indicate a non-uniform change, unorganized and chaotic. Like shards of broken glass they fracture the entire composition. The shifting that takes place in the color banding because of their presence helps to define this effect even more clearly. What you may or may not see are the squares. There are 4 of them, 5 if you count the actual boundary of the document. They represent the underlying structure of the composition, dividing it subtly into 4 stable quadrants. Whether it be the 4 quadrants or the actual boundary of the document, the square shape appears to contain the chaos, preventing it from escaping. Today’s design is a simple illustration of a bee using mostly ovals. Nothing too exciting to say other than I think its pretty good. Enjoy. I urge everyone to check back tomorrow for a special post in honor of the new MacGruber movie. I will give you all a hint – my cat, named Q, is sometimes called “MacQuber”. Today’s design is a simple illustration of an owl. I have been noticing a lot of owls around lately which inspired me to create this one. No, not real, live owls. I’ve been seeing them drawn in some other illustrations and in clip art. I was also at a garden center last week and saw some owl sculptures created from round stones. I didn’t have my camera with me at the time or I would have taken a photo. They were kind of neat. Anyway that’s my owl story. I may be inclined to create some more detailed owl illustrations in the future. If you haven’t read my supplimental post from yesterday about submitting ideas for the next project please read the details here. I am looking forward to your ideas. Thanks. 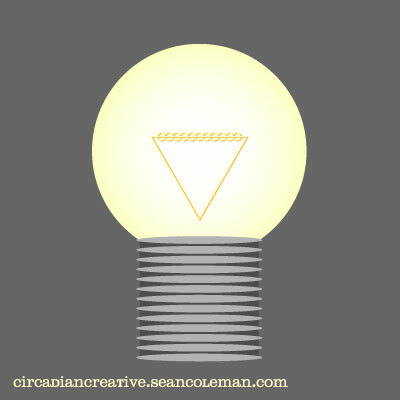 Today’s design is a simple illustration of a light bulb, but I used basic shape forms to create it. This is were I’m headed with the Basic shape forms, using them to create simple illustrations of common objects. The bulb is created using a circle, the filament is a triangle with repeated circles to represent the coil. The base is created with a square with overlaid ovals to create the basic effect of the screw threads. Very simple stuff but with the proper placement of all the components and the right colors, it’s a pretty effective image. If you haven’t read the previous post about submitting ideas for the next project please read the details here. Thanks. Today I am revisiting the 4 sided shape, the square. 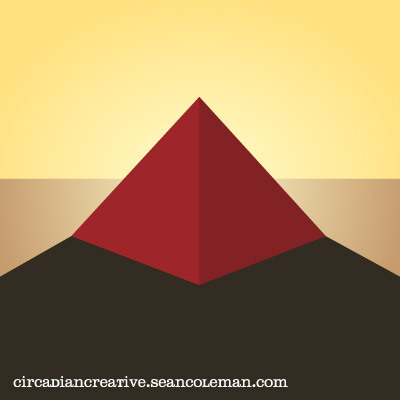 Like yesterday’s post with the triangles/pyramid, I am going 3D again with the image. 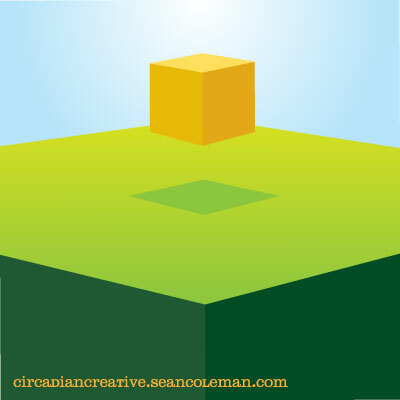 I created a large green cube and thinking back to my thoughts on the square as a foundation, I cropped in on the cube making it seem like a platform. I then created a second smaller cube to rest on this platform. After playing around with the image I decided to have the golden cube appear to be floating. To create this effect I created a shadow below the golden cube and used a light to dark gradient of color in the background (sky) to give a feeling of light from above. This helps to further define the shadow under the cube and enhances the overall effects of dimension and light, as well as make the golden cube appear to float. All hail the hypnocube! The illusion we are looking at today is perceived dimension. I know what you all see here but now look at the image again. It is basically 2 triangles side by side. Coloring each of them with slightly different colors creates the illusion that you are actually looking at a 3 dimensional pyramid. The use of color contrast in the background and foreground not only enhances the the 3D effect but additionally creates the illusion of light and depth of field. It’s like you are looking west at sunset in Egypt, but you are really just looking at a couple cleverly situated triangles. Enjoy! See you all tomorrow.